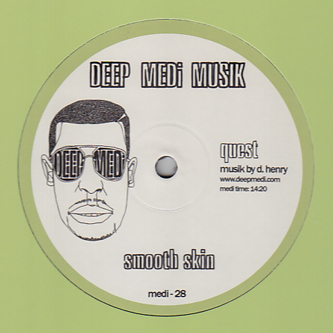 Original dubstep maestro Quest takes an about turn from 140bpm steppers towards a luscious slow house sound on 'Smooth Skin'. It's a highly successful detour too, finding compatibility in the drag-grooves of NWAQ or Mark E while still retaining its own sub-heaving swing and that crisply turned-out finish. In case the dubsteppers are feeling disenfranchised though, 'Wind Tunnel' is a deadly intricate halfstepper with pursed sci-fi synth wipes and an inherent darkside jungle flavour. Deep Medi on it as ever!